The Starbucks blend masters at the Seattle headquarters have come up with an all-new Frappuccino for you to enjoy: The Cherry Blossom Frappuccino. (So named for the beautiful pink and green colors, reminiscent of cherry blossoms). Be sure to snag this Frappuccino the 15th – 20th of March. First, the barista measures milk (whole milk is the default) to the first line of the cup, strawberry juice to the second line, and Classic Syrup. (Classic syrup is like a plain sugar water). It’s the same strawberry juice that is used for the Strawberries and Creme Frappuccino. The barista adds 2 pumps of Classic Syrup for a Tall size (12 ounces); 3 pumps for a Grande (16 ounces); and 4 pumps for the Venti size. The milk-strawberry juice – syrup mixture gets poured into the blender. As with every Frappuccino, next comes ice and a Frappuccino base. In this case, it’s the creme base, which does not have coffee in it. The base in a Frappuccino is a special Starbucks proprietary syrup that adds a touch of sweetness and helps the drink to not separate too quickly. Next the beverage gets blended. 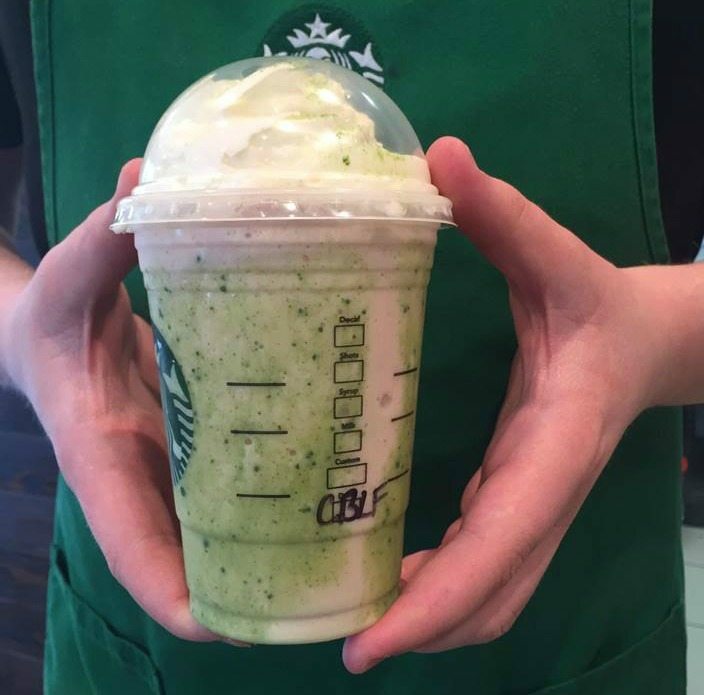 Before the Frappuccino gets poured into the customer’s cup, the barista will line the cup a couple of times with white-chocolate matcha drizzle, made special for this limited-time Frappuccino promotion. Your drink will have a fun blend of pink and green in it (it’s nearly spring!) and will have a touch of a white mocha sauce flavor to it too. (There’s no coffee in this Frappuccino. White mocha describes a white chocolate flavor). The Cherry Blossom Frappuccino gets finished with whipped cream and a few shakes of matcha powder atop the whipped cream! 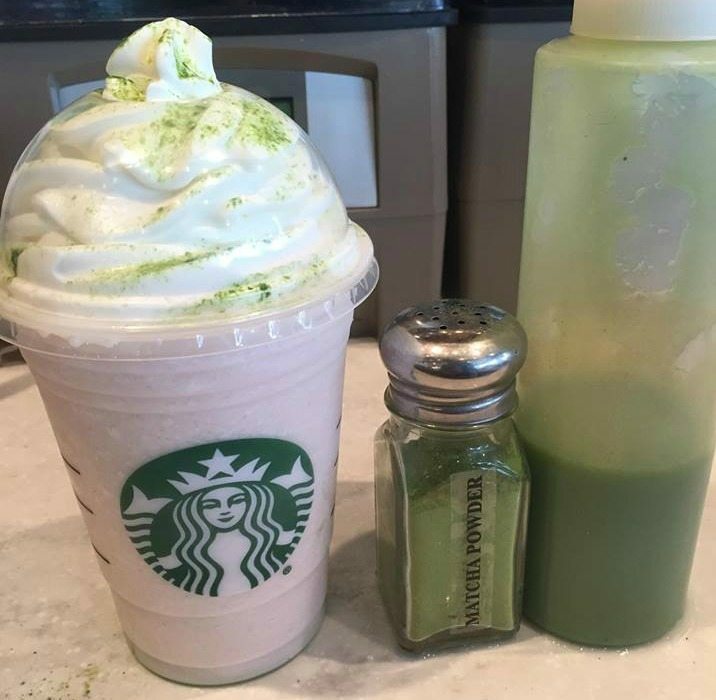 Just a tip about this drink: if you order the Cherry Blossom Frappuccino a little heavy on the white-mocha-matcha drizzle, you’ll get a more green drink than pink in color. St. Patrick's Day Starbucks T-Shirt! Is this the same as the Sakura drinks Starbucks has been doing seasonally in Japan? This is much more green looking though but it’s essentially Strawberry there. @Katherine – Hi there! Good question! It’s really not the same Frappuccino at all as the Japanese Sakura version. This only kind of looks reminiscent of spring with shades of pink and green, but the flavor is primarily going to be sweet, with strawberry, white mocha, and matcha. It’s the color and look of the drink that gives it the name “cherry blossom” more so than a flavor. Thanks! I was super excited about this because I used to drink Starbucks Cherry Blossom Latte’s in Korea, but it’s not the same flavor …. Apparently this is not available in Canada. Really not a fan of this regional beverage release thing that Starbucks seems to be doing more of lately (yes, Canada and the US are different countries, but we usually seem to be treated as the same market for everything else). I also just read we’re not getting the Maple Macchiato this year or the Blossoming Peach Tea Latte. I hope there is something really good in the works for March 22nd, as the Smoked Butterscotch is supposed to end on the 21st. Thank you for explaining the whole drink, I went to a starbucks in downtown Toronto and they said they never heard of it but if I know how to make it they’ll make it for me. I’ve been searching for this very information for the past five days. Thank you! It’s strawberry inside the drink. Not cherry. Why, call it a “cherry blossom drink” IF you put strawberries in it? Yes, strawberry is the same color but not the same flavor. So, why not call it “strawberry blossom drink” instead? Not to mention some don’t like strawberries. I don’t, but I do like cherries. Love them actually.